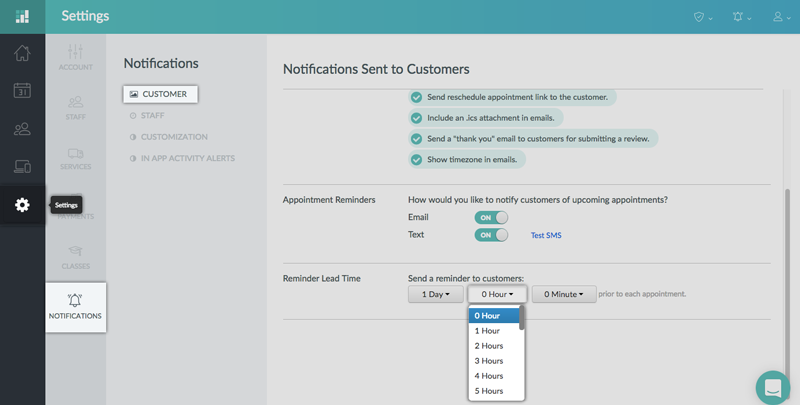 Help reduce no-shows with automatic email reminders, sent hours or days before an appointment. 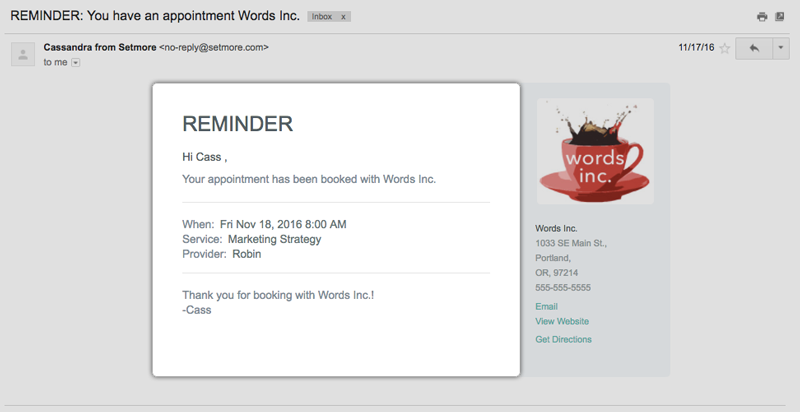 Email appointment reminders will notify your customers about their upcoming appointments and include basic information such as the service, provider, date and time. You specify how soon before an appointment you want the reminder to go out. This feature is included with the free version of Setmore. 1. Navigate to Settings > Notifications > Customer. Scroll to the section titled Appointment Reminders, and where it says "Email," click the On/Off switch to the "On" position. Email reminders are now activated. 1. Navigate to Settings > Notifications > Customer. Scroll to the section titled Reminder Lead Time, and use the dropdown menus to select how long in days, hours, and minutes before an appointment that you would like the reminder to be sent. While you may not change the basic content of a reminder email, you may customize what appears in the Email Sender field, along with the email signature. 1. Navigate to Settings > Notifications > Customization. In the sections titled Sender Name and Email Signature, click on the form field and enter your custom details. Click outside the form field in order to save your changes.